Balaram Hajra, often referred to as the Dhol magician, passed away on April 10, 2017, at the age of 70. He was suffering from cancer during the last year of his life. A renowned Dholi or Dhol player from the Dooars (Duars), he was known to mesmerize his audience with his magical beats. Born in the village of Thakurganj in Rangpur district, Bangladesh, he was ten years old when he started learning the Dhol from his paternal uncle, Sarol Hajra, who was a master of several instruments and also headed a Jatra (folk theatre of Bengal) group. Balaram moved to India in the fifties with his family and settled in Hajrapara in the village of Dakshin Patkapara in Alipurduar, Jalpaiguri district. In this village, abundantly peopled by folk musicians, he started playing the Dhol professionally, wherever he got the opportunity, often playing for jatra groups and even as part of the street advertisement for a beedi company of Cooch Behar. He was about fourteen years old when he started accompanying Bhawaiya songs and at the same time, also began training under the famous Dhol master of Alipurduar, Tenu Badyokar. His training was thorough and continued for ten years. The next phase of his training began under the watchful guidance of Jiten Bhattacharya of Jalpaiguri who taught him the skills of classical music on the Tabla and Pakhawaj. Side by side with his training which continued for nearly fifteen years, he worked as an accompanist at weddings, jatras and other events. He would play Tabla, Pakhawaj, Naal, Khol and other folk percussive instruments, but mainly focussed on the Dhol. He began to perform at tea gardens regularly and that earned him both a reasonable amount of money as well as fame. 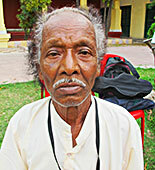 But with crisis hitting the tea estates, Hazra`s hardship began. The local government, at the behest of Sukhbilas Barma, bureaucrat and Bhawaiya singer, finally recognised this superb Dhol player in 2005 in the form of the Abbasuddin Puraskar. He was then given the title of Dhol Jaadugar (Dhol Magician). More awards followed including the Thakur Panchanan Barman award (awarded to him by the Chief Minister) and the Uttar Banga Ratna, both in 2014. In January 2017, he received the Banga Ratna Samman award, also from the Chief Minister of West Bengal, Smt Mamata Banerjee. Hajra, survived by his wife, son and two married daughters often used to rue the fact that his son had not followed in his footsteps. However he had great hopes in his young grandson. He had many students both from urban and rural areas and was often called to conduct workshops. He was also a part of a government programme where he trained six students for eighteen month periods. He managed to survive on the income he made from his year-long programmes and a little from his teaching. He later began to receive pension from the government. Hajra`s favourite Dhol was 250 years old. Made from mango wood, he had procured it from a Dhol ustad from Barisal (Bangladesh). According to him, the Dhols made here are the best, while Dhaks made at Bikrampur are supreme. (Dhol-er Raja Barisal, Dhak-er Raja Bikrampur). This outstanding musician`s piece-de-resistance was playing 25 Dhols all together!